P88121LF-SSSD-W is rated 3.8 out of 5 by 13. Rated 5 out of 5 by mindy from Looks fancy We bought this in March and it looks so nice and we love how the handle pulls down and is very convenient!! Rated 5 out of 5 by Jeanne from Good looks I like the way it looks, and it is so easy to operate. Rated 5 out of 5 by sunshine from Love it! This faucet adds to the looks of the kitchen! I love its features! Rated 3 out of 5 by Scotts555 from Loved it until it leaked. Bought in November of 2017 from Wal-Mart. Started to leak inside of main body , underneath sink in July of 2018. Maybe an Isolated case, Loved the features. Planning on returning. 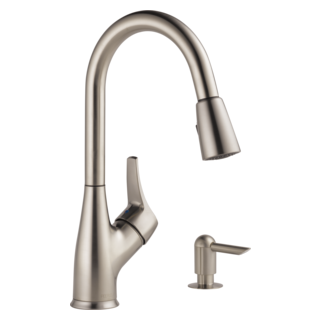 Rated 3 out of 5 by bobjr94 from Ok but not a straight install First the built in water supply lines are about 4 inches too short to reach the supply valves, you can't re-use your old lines like replacing a regular 2 handle faucet. Then the lines and fittings are smaller then the original lines but they don't include an adapter, so I had to go back and buy an extension and adapter. Rated 4 out of 5 by Plum Bob from Seems to be a fine product Just purchased last week so there isn't much I can say about this other than it was a good deal for what we paid. The only thing that was obvious right away was the 3/8" supply lines have restricted the water volume quite a bit from the 1/2" supply line they replaced. All in all it looks nice, works well and was easy to install. Rated 2 out of 5 by cbrooks from Sprayer button wears out quickly The sprayer button will not stay on stream unless you hold the button. Can you buy this without the soap dispenser? Just installed this faucet in the kitchen but the attachments arent long enough to reach our water supply in the wall. Is there any attachments available? Can this faucet be used along with a portable dishwasher. I am very disappointed to hear the aerator cannot be removed because now I cannot figure out how to use my portable dishwasher. How to I remove the aerator from this faucet? 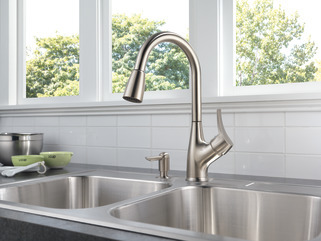 Is there some kind of adaption system for this faucet for a portable dishwasher? The spray button stopped working properly, and I am getting both the stream and spray at the same time. Can this be repaired without having to purchase an entirely new faucet?